National Theatre Wales’ 2019 season will be led by four brand new productions, all made with leading Welsh and Wales-based artists. Announcing the season, National Theatre Wales’ Artistic Director Kully Thiarai said: “I’m thrilled to announce our 2019 season, which brings together and celebrates the work of some of Wales’ very best artists, theatre-makers and companies, playing to audiences across Wales and beyond. “The productions in 2019 include stories of hope, resilience and imaginative flights of fancy, brand new works, substantial tours and international collaborations. “I’m particularly excited by the depth and diversity of the work exploring themes of truth and perception. From stories of rural Welsh life to space exploration, from watery, sensory worlds to personal freedoms and the right to choose your future, the season reflects the many questions facing us all, locally and globally. Making his return to the stage after 15 years, writer Ed Thomas‘ On Bear Ridge will be a stage play inspired by his childhood village – and the blurring of his memories of it. For the first time, NTW will collaborate with pioneering theatre company Hijinx, as well as directors Kully Thiarai and Ben Pettitt-Wade and artists Seiriol Davies and Tim Rhys Evans to create Mission Control. With a professional and community cast of hundreds, this original show will examine the insatiable mythology that has always circled the story of man’s first landing on the moon. Mike Brookes will direct Together and Alone, the latest instalment of his Storm Cycle, which explores themes of truth and testimony. This third production in the series will use text and spoken-word performance to reflect on Wales’ recent social and political uncertainty – as we move towards a withdrawal from the EU. And in an international project with Wales in Venice 2019 for the Venice Biennale, artist Sean Edwards will create a new radio play, exploring the value of being the most honest version of oneself. NTW will co-produce the play to be broadcast live to his exhibition in Venice, which will later move to Wrexham. In addition, four productions from NTW’s NHS70 season will tour to theatres and arts venues the length and breadth of Wales, and further afield. These include three of the festival’s monologues; Cotton Fingers, Peggy’s Song and The Stick Maker Tales, and Splish Splash, a multi-sensory, underwater production for young people made by Oily Cart that will tour special schools in Wales and England. The season will kick-off with an open event. National Theatre Wales invites everyone invested in theatre in Wales to take part in a big, creative conversation about its future, and NTW’s role in that future. As the company approaches its 10th year, it’s in robust and thoughtful conversation with artists who care deeply about their nation’s theatre. Join NTW on Sunday 3 March 2019, in Cardiff, as it takes the opportunity to widen that conversation and throw open the doors. What is your dream for theatre in Wales in the next decade? What do artists and audiences need now and in the coming years? How can we all play our part? This will be a free and open event with a warm welcome to all. •	six strands of Creative Development work – the biggest the company has ever undertaken. Looking further ahead, National Theatre Wales’ 2020 season, for which several new Welsh plays are already under commission, will celebrate the company’s 10th birthday. A call-out was made in November for Welsh women artists to submit ideas for a major new work to form part of the 2020 season, in a project called Radical Creatures. Nick Capaldi, the Arts Council of Wales’ Chief Executive, said: “This programme launch reaffirms National Theatre Wales’ belief in the importance of working with the best of Welsh talent. To see writer Ed Thomas’ return to the Welsh stage announced alongside the ever-inventive Hijinx and their wonderful team of neuro-divergent and learning-disabled actors is to be reminded of the range and diversity of National Theatre Wales’ collaborations. Further details on the 2019 season will be announced – and tickets will go on sale – in the new year. Ed Thomas, one of Wales’ leading playwrights and co-creator of hit television series Hinterland/Y Gwyll, returns to the stage with this brand new play. The play will form part of a trilogy of deeply personal work. In addition to the trilogy, NTW is working with the Royal Court on a series of ongoing opportunities for writers and artists in Wales around the production of On Bear Ridge. More details on these, and the trilogy, will be announced in the new year. Ed Thomas is a playwright, director, screenwriter and producer whose work has been translated into more than 10 languages, toured internationally and garnered more than 90 nominations and awards including BAFTA, New York Film Festival and Golden Nymph Monte Carlo. His plays include House Of America, East From The Gantry, Song From A Forgotten City and Stone City Blue. For NTW he adapted Bertolt Brecht’s Mother Courage & her Children (2015) and his last production at the Royal Court was Gas Station Angel (1998). He is also Creative Director and Founder of film and tv production company Fiction Factory. His credits include Satellite City, A Mind To Kill, Silent Village, Cwmgiedd/Colombia, China, Caerdydd, Dal Yma:Nawr, Pen Talar and most recently detective series Hinterland/Y Gwyll for S4C/BBC/Netflix and distributed to over 80 countries by ALL3Media. The Royal Court Theatre is the writers’ theatre. It is the leading force in world theatre for energetically cultivating writers - undiscovered, emerging and established. Through the writers, the Royal Court is at the forefront of creating restless, alert, provocative theatre about now. We open our doors to the unheard voices and free thinkers that, through their writing, change our way of seeing. Over 120,000 people visit the Royal Court in Sloane Square, London, each year and many thousands more see our work elsewhere through transfers to the West End and New York, UK and international tours, digital platforms, our residencies across London, and our site-specific work. Through all our work we strive to inspire audiences and influence future writers with radical thinking and provocative discussion. The Royal Court’s extensive development activity encompasses a diverse range of writers and artists and includes an ongoing programme of writers’ attachments, readings, workshops and playwriting groups. Twenty years of the International Department’s pioneering work around the world means the Royal Court has relationships with writers on every continent. Within the past sixty years, John Osborne, Beckett, Arnold Wesker, Ann Jellicoe, Howard Brenton, David Hare and many more started their careers at the Court. Many others, including Caryl Churchill, Athol Fugard, Mark Ravenhill, Simon Stephens, debbie tucker green and Sarah Kane have followed. More recently, the theatre has fostered new writers such as EV Crowe, Rachel De-lahay, Lucy Kirkwood, Cordelia Lynn, Nathanial Martello-White, Alistair McDowall, Gary Owen, Nick Payne, Tim Price, and Penelope Skinner and produced many iconic plays from Laura Wade’s Posh to Jez Butterworth’s Jerusalem and Martin McDonagh’s Hangmen. Royal Court plays from every decade are now performed on stage and taught in classrooms and universities across the globe. It is because of this commitment to the writer that we believe there is no more important theatre in the world than the Royal Court. Half a century after the first moon landing, Mission Control explores the dark side of the moon. Performed by a cast including professional neurodivergent and learning-disabled actors, as well as members of the Only Boys Aloud choirs, this immersive spectacle will re-recreate the atmosphere of fear, paranoia and optimism that led to two great powers believing they had to be the first to land a man on the moon. A brand new production examining the nature of truth, propaganda, espionage, manipulation and the necessity and redemptive power of myths. Kully Thiarai has worked in the performing arts for many years as a theatre maker, artistic director and arts consultant. Her early career was largely in new writing with national touring companies like Red Ladder Theatre Company and Major Road, both based in Yorkshire. She has since led a number of organisations and companies including being Artistic Director of Contact Theatre, Manchester, Leicester Haymarket Theatre, Theatre Writing Partnership and Red Ladder Theatre Company; commissioning, producing and directing work nationally and internationally. She has created a diverse range of work that spans communities, cultures and performance styles; has directed large-scale epics, new plays and made work in non-theatre spaces. Before joining National Theatre Wales as artistic director in May 2016, she was the founding Director of Cast – a new £22 million performance venue that is the cultural living room for the town; a place for performance, participation and provocation. Her work for National Theatre Wales includes Sisters (National Theatre Wales/Junoon), The Stick Maker Tales and Tide Whisperer. Kully is a Clore Theatre Fellow, Fellow of the Royal Society of Arts and a Trustee of the Manchester International Festival. Ben Pettitt-Wade is Artistic Director at Hijinx. He has been with the company for the past 12 years in various roles. He has devised and directed numerous productions for the company, including Snoutology for Beginners, Snooks Brothers Bank, Snooks Brothers Aquatic and the company’s 2016 Edinburgh Festival Fringe hit show Meet Fred, which has now been translated into nine languages, toured throughout Europe, to USA, China and Korea and continues to be in high demand. His most recent production, The Flop, was shortlisted for a Total Theatre Award at the 2018 Edinburgh Festival Fringe. He is one of the UK’s leading directors specialising in creating performances that include learning disabled artists. Seiriol Davies is from Anglesey, trained at the London International School of Performing Arts, and is a performer, writer and composer. He has made shows with companies including Punchdrunk, Gideon Reeling, Underbling & Vow, One Tenth Human and Caroline Horton & Co. His first musical, How to Win Against History was the #1 best reviewed show of Edinburgh Fringe 2016, and had a sellout run there that year and 2017. It then toured the UK and transferred to the Young Vic in London. He is currently working on a follow-up, called Milky Peaks. Other recent work includes Effigies of Wickedness with English National Opera and The Gate, and The Greatest Wealth at The Old Vic. Awards include: Oxford Samuel Beckett Theatre Trust Award, The Stage Award for Acting Excellence and a Cân i Gymru Special Jury Prize. Tim Rhys-Evans MBE from New Tredegar in South Wales is a highly sought-after choral conductor, arranger, composer and TV presenter. After working extensively in opera and music theatre, he created the group Only Men Aloud, a Welsh male vocal ensemble whose highlights have included winning BBC’s Last Choir Standing, winning Album of the Year at the Classical Brit awards, singing at the opening ceremony of the London 2012 Olympic Games and recording and performing internationally. Tim believes passionately in the transformative power of music and that everybody should be given the opportunity to engage in the arts. To this end, he established The Aloud Charity which runs the choirs Only Boys Aloud and Only Kids Aloud. With the shared aims of reinvigorating the Welsh male choir tradition and affecting real change in the lives of young people from areas of social deprivation, these initiatives have improved the lives of thousands of children from some of the poorest communities in Wales. 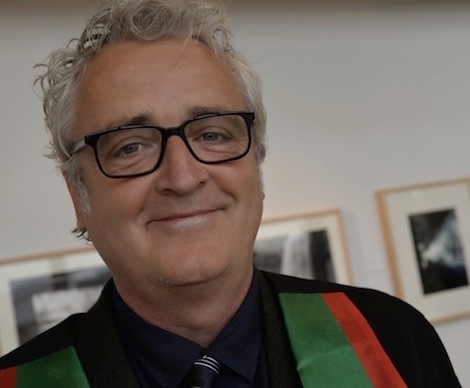 Tim is also an outspoken advocate for mental health issues and his Tim Rhys-Evans - All In The Mind documentary won a BAFTA Cymru Award following its network broadcast on BBC One. Hijinx is one of the largest and most successful inclusive theatre companies in the world. They always cast professional, neurodivergent and learning-disabled actors in their shows. The ability of these effortlessly talented performers is at the heart of every show they produce, creating work that is utterly absorbing, surprising and provocative. Hijinx train their actors in five Academies across Wales, source role play and acting jobs in the screen industries for them, run a far reaching participation programme and have recently launched a new film strand. The company’s award-winning productions and projects are in great demand and tour across Europe, North America, East Asia and Africa. At Aloud we aim to engage each new generation of young people across Wales with the power of choral singing and through this activity to promote self-belief and self-confidence, to encourage aspiration, to build skills and to develop a sense of community. We believe Aloud makes a unique contribution to sustaining and reinvigorating the cultural landscape of Wales and encourages audiences across Wales and the world to engage in new ways with the extraordinary Welsh choral tradition which underpins our existence. Established as a charity in 2012 to administrate a number of choral projects already up and running across the country, Aloud now delivers activity through three main strands: Only Kids Aloud, Only Boys Aloud and the Only Boys Aloud Academi. explores some of the assertions, emotions and questions that have bubbled away under Wales’ recent social and political unrest – and that seem to have been pushing us, as well as much of Europe and the US, towards arguments about who ‘we’ are, and how we assert and protect ‘ourselves’. It will be made and performed in the weeks before the UK’s planned withdrawal from the EU. STORM.3: Together and Alone will feature text inspired by The Ethics of Ambiguity, an extraordinary collection of essays written by Simone de Beauvoir amidst the desolation and optimism that followed the Second World War, at the birth of the Europe in which we now live. Audiences will be invited to meet and engage with the performers in an immersive production that will offer a space to revisit and reflect on our own personal drives and choices, who and how we might want to be, in our hopes and fears for the future. The Storm Cycle is a series of productions conceived and directed by Mike Brookes (with Mike Pearson, for the first two instalments). These multimedia works are being made and performed at different locations across Wales, at a variety of scales and sizes, and explore two key themes; truth and testimony. Mike Brookes is an award-winning artist, director and designer, whose work has always bridged media. He co-founded the performance collective Pearson/Brookes in 1997, focusing on intermedial and located performance work, most recently co-creating a series of acclaimed large-scale works in collaboration with NTW – including The Persians, Coriolan/us and Iliad. His work has been widely commissioned and presented across Europe, Asia, Australasia, South America and the USA, over three decades of innovative and immersive theatre making. This new work will be an experimental radio play, and will form a key element of Edwards’ solo presentation for Wales in Venice 2019, commissioned by the Arts Council of Wales and led by T&#375; Pawb, Wrexham. The play is a poetic enquiry into place, social history and class, intertwined with the artist's own personal history. The script will be collaged from found text and real voices. The decision to draw on autobiography is driven by Edwards’ belief that you can create a greater connection with the audience through the inclusion of the most ‘honest version’ of yourself. Through the work, Edwards intends to capture and translate a condition of ‘not expecting much’ - a phase he uses to evoke a way of living that is recognisable to a huge proportion of the population in Wales - a way of making do and getting by. Sean Edwards (born Cardiff 1980) trained at Cardiff School of Art & Design, gaining a BA (Hons) in 2003, and at Slade School of Fine Art, gaining an MA in 2005. While working across objects, film, video, photography, books and performance, Edwards is most known for his investigation into the sculptural potential of the everyday. Often using remnants of previous activities as a prompt, his sparse and poetic enquiries intertwine biographical details with wider social and cultural histories. In 2014 he was awarded the Gold Medal for Fine Art at The National Eisteddfod Wales and is currently developing permanent public artworks with Future City, Cambridge and Studio Response, Cardiff. He is currently a lecturer in Fine Art at Cardiff School of Art & Design, Cardiff Metropolitan University. His work is held in a number of private and public collections including the Arts Council Collection. The Venice Biennale is the largest and most prestigious visual arts exhibition in the world. Cymru in Fenis/Wales in Venice is commissioned and managed by the Arts Council of Wales with support and collaboration from the Welsh Government and British Council, and has represented the best in contemporary art from Wales in Venice since 2003. T&#375; Pawb is a cultural community resource, bringing together arts and markets within the same footprint. This coexistence celebrates the significance of markets within Wrexham’s cultural heritage and identity. The development is a new space for dialogue around subjects including social and civic issues, the environment, health, cultural identity, sustainability and education. T&#375; Pawb present a contemporary programme of welcoming and inclusive exhibitions, socially engaged projects and live performance. The programme emphasises skills and craft, working with emerging and established artists from all backgrounds. A multi-sensory, underwater, touring production for young people aged 3-19, touring special schools across Wales and England – Splish Splash is a watery wonderland, a magical space where every sense is delighted. This pioneering production comes in three versions: one for those with profound and multiple learning disabilities, another for those on the autism spectrum, and a third for the deafblind. Shepherd Geth Roberts might be getting on in years, but he still lives alone, high in the Elan Valley. A born storyteller, he’s spent his whole life working his wild and windswept farm. But now Geth faces his greatest challenge: his sight is failing and if he can’t see, then he can’t work the farm. Peter Cox’s one-man show is a heartwarming tribute to hill-farming communities across Wales. As Aoife’s boredom and hunger are satisfied by half an hour in Cilian’s bed, her life changes forever. It’s request night on St Bevan’s Hospital radio and DJ Danny Walkman’s show is in full swing. His gags and record collection might be criminal, but under it all there’s a heart of gold, a quiet sadness and a real care for people. After his show, Danny has a chance encounter in the Garden of Hope with Peggy. A plain-speaking firecracker, Peggy’s been sleeping rough for years and isn’t afraid to call a spade a shovel. They’ve nothing in common of course. Except music. Everyone likes music, don’t they? Everyone’s got a song, and if there’s one thing Danny Walkman is good at, it’s getting people to tell him what their song is. A comic slice of Welsh writing, Peggy's Song is a light-hearted, one-man show about a hospital radio DJ that pays tribute to the many volunteers who give their time to the NHS.